Inventory We are a resale marketplace, not a box office or venue. Ticket prices may exceed face value. This site is not owned by Capitol Theatre Port Chester . The Capitol Theatre is a historic theatre built in 1926 by noted theater architect Thomas W. Lamb. 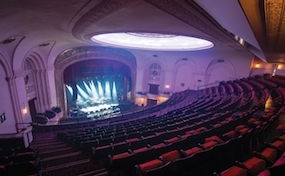 There is seating for 1,800 people at concerts and other events, such as comedians. In its history, Capitol Theatre has functioned as a movie theatre and catering hall in addition to hosting concerts. On opening night, it was to function as a movie theatre, and sold out all 2,000 available seats. The success has continued since that night, as Capitol Theatre transformed into the entertainment venue it is today. The Capitol featured Pink Floyd, The Greateful Dead, Phish, and The Rolling Stones. The facility went through a stint as a catering company, and then reopened with Bob Dylan in 2012. TheatrePortChester.com is not currently affiliated with any box office, venue, website, or official supplier. We are a privately owned and operated company that specializes in offering tickets to all events in the resale secondary ticket marketplace. Prices on our sites can be well below or above face value but will change quickly with demand. To order tickets to all Capitol Theatre Port Chester New York events please call our friendly staff at anytime or follow the steps online through checkout.